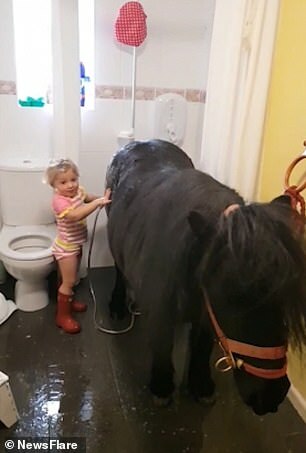 An three-year-old horse lover decided to give her Shetland pony a shower – by bringing him indoors and tethering him to the toilet roll holder. Adorable Harriet’s cunning plan is rumbled when her mother comes into the bathroom in the video filmed in Northwich, Cheshire. 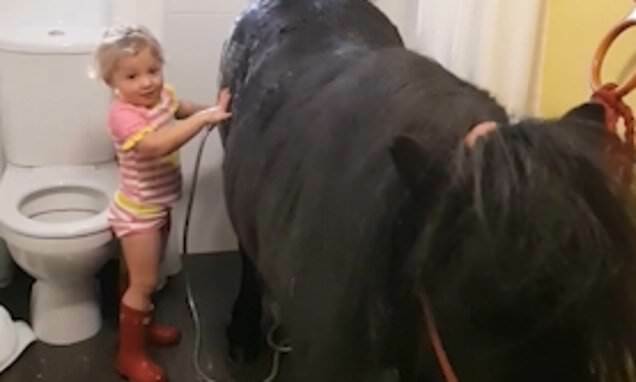 The little girl is seen sweetly smiling as she holds a shower head to the black Shetland pony and expertly washes his back and legs. The pampered horse looks around at Harriet when she stops spraying him and seems content to be washed by the adoring toddler. This doesn’t seem like it’s the first time the youngster has invited the horse into the house for a wash.
She then shouts for another person, Hannah, to come and see what her cheeky daughter has been up too. Proud Harriet, who is dressed for the occasion in her welly boots and swimming costume, again declares: ‘I’m washing Wicked’ as the other women laugh. 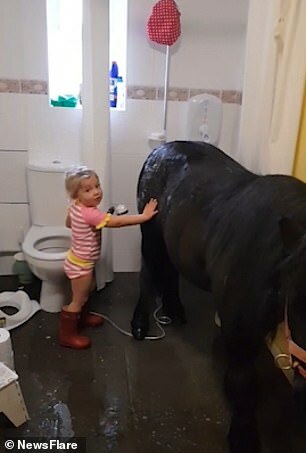 The Shetland pony starts to kick at the ground as the little girl rubs its back and continues washing. 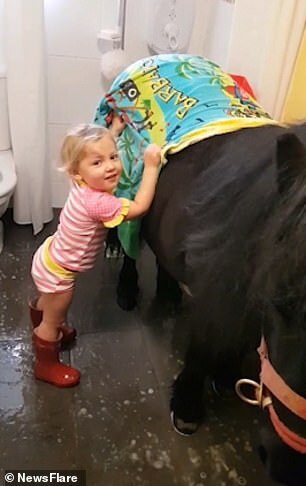 Harriet then carefully towel dries her pony, making sure to pat him dry and lovingly stroke his mane. At the end of the video Harriet’s mother asks ‘who tied him up to the toilet roll holder? 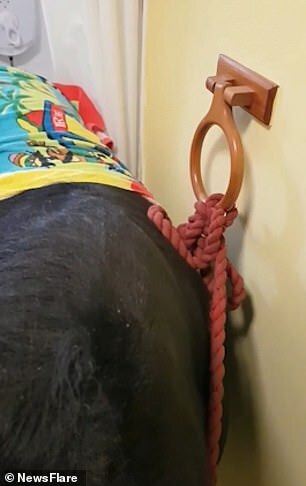 and the camera zooms in to show the horse tethered to the side. Harriet beams a proud smile at her mother when she realises her adorable plan has been successful.